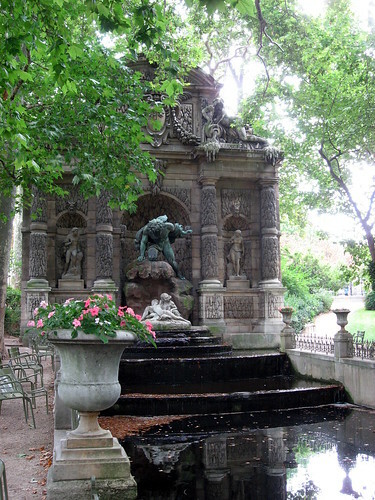 I continue my Paris holiday retrospective with a few pictures of fountains and bits of gardens that I especially liked. Old European cities like Paris seem to be filled with these pretty details. 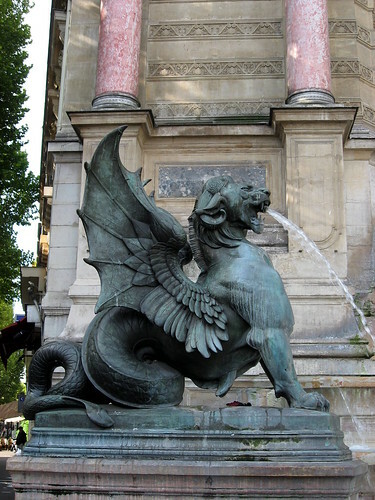 The Fontaine St-Michel had these wonderful mythical creatures spouting water. 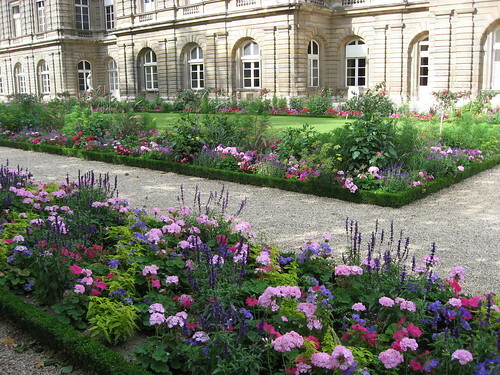 I loved the flower plantings in the Jardin du Luxembourg. I thought the colour scheme and mixture of textures was beautiful. 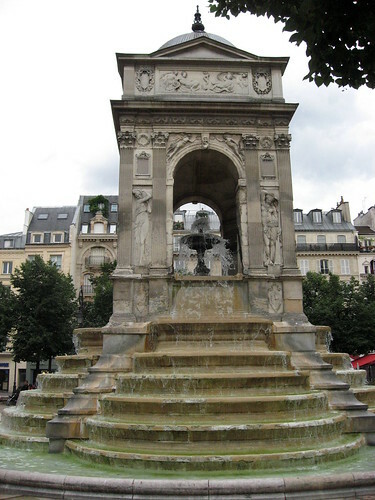 This fountain in the shade was also in the Jardin du Luxembourg. This fountain was near the Centre Pompidou. 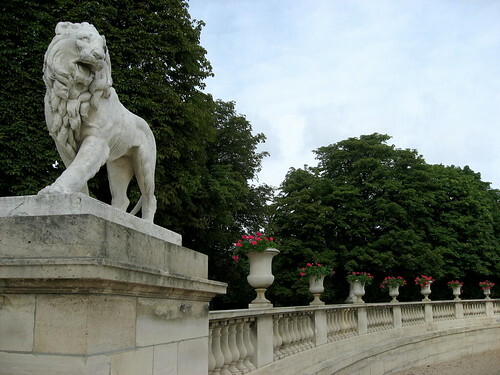 I spotted this "parade" led by a stone lion in the Jardin du Luxembourg. You can see all the photos from our holiday in my trip to Paris set. 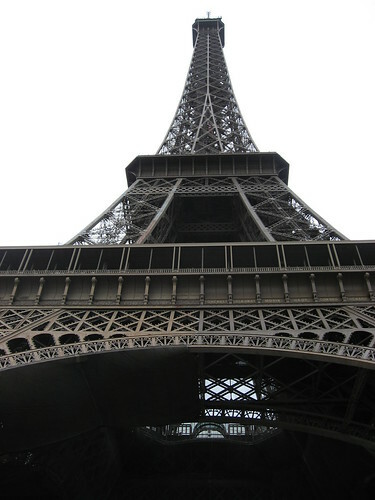 On our first visit to Paris, of course we went to see some of the sights that have made the city famous. The end of August/beginning of September was an excellent time to visit as the weather was still nice, but it wasn't intensely busy. We had a picnic in the park by the Eiffel Tower. It's an incredibly cheesy thing to do, but it was also really fun. 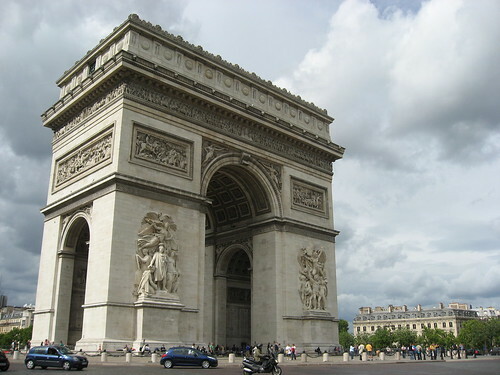 After seeing the Eiffel Tower we walked over to the Arc de Triomphe. Apparently there's some underground passageway to get over to the centre, across the huge, busy roundabout, but we just looked at it from across the street. 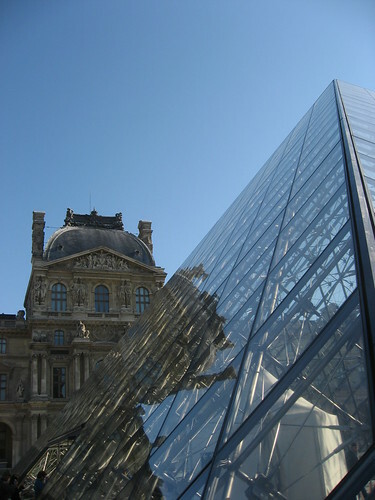 At the Louvre, the old palace and the new glass pyramid entrance provide a pretty juxtaposition. We spent a good bit of time in the Louvre, which is a complete maze. The map isn't that helpful since portions of the museum are shut for renovations or setting up new exhibitions, blocking off any clever routes you might plan. Lots of neat stuff to see, of course! 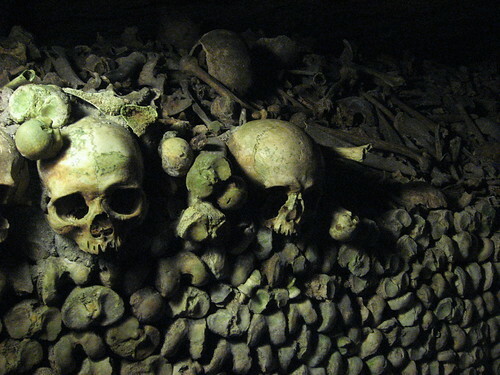 Something that's hard to explain if you've never visited the Catacombs, is that the part with the skulls and bones, while macabre, isn't the spooky bit. It's walking down the long, low, dim corridors to get there. I was walking at the front of the group who went down with us and so since the tunnel is only one person wide, I couldn't see anything except more tunnel in front of me. Occasionally it would turn and there would be more damp, dim, empty tunnel stretching out in front of me. It was fascinatingly creepy and felt like it might never end. 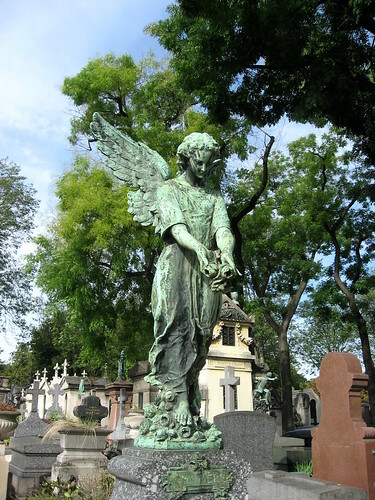 The Père Lachaise Cemetery has many beautiful monuments, as well as the graves of assorted famous people. Apparently that's actually how it all got started. They needed to make a new graveyard because the ones in central Paris were over-full and causing disease problems. But it was so far away that people wouldn't want to be buried there, so they exhumed graves of famous people and re-buried them in the new cemetery as a marketing technique! 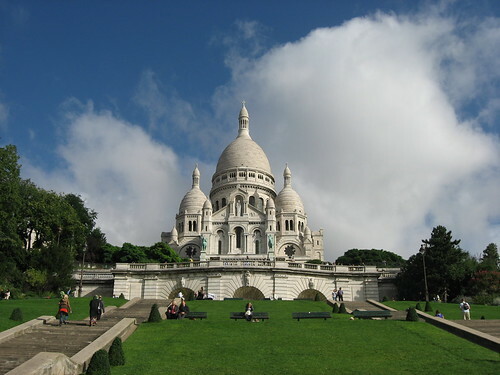 Sitting atop the highest point of Paris, in Montmartre, the Basilique du Sacre-Coeur is a stunning sight. 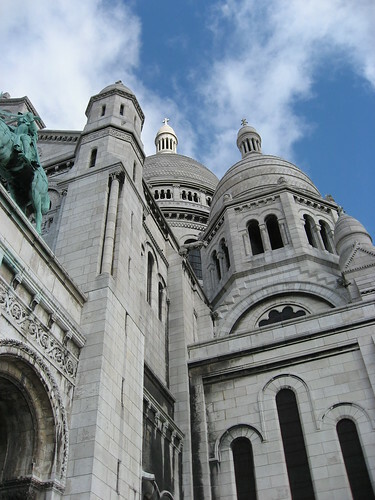 While the outside of Sacre-Coeur is very beautiful, the interior felt quite austere in comparison to the extremely ornate cathedrals in Italy! 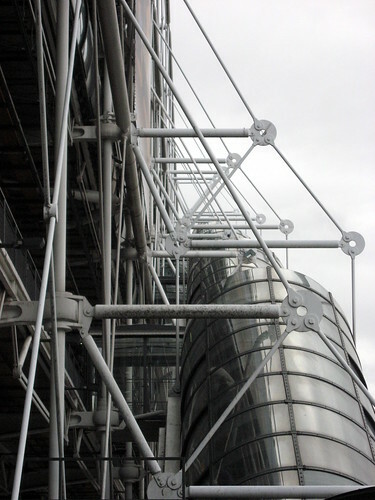 The Centre Pompidou is perhaps less famous than some of these other sights, but it's one of the more remarkable modern architectural landmarks in Paris. 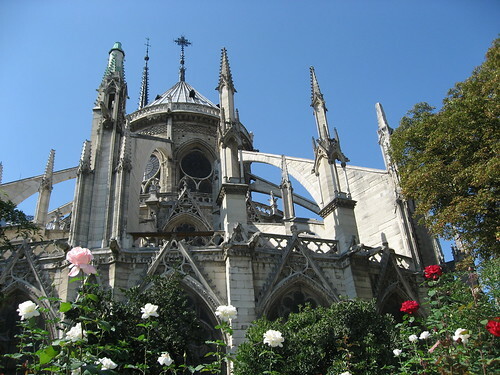 The Notre-Dame cathedral was very pretty and we ate sorbet in a little park nearby on a sunny afternoon when we realised that we were fed up with looking at things in museums. I'm glad we did, or I would have missed this shot of the cathedral looking up through the roses. I thought it fitting to start my Paris holiday retrospective with two of the things Paris is best known for: food and fashion. Thoughts on food: We had a lovely time eating our way around Paris. We tried little cafes and bistros, had picnics in various parks, and had a fantastic meal at a Michelin-starred bistro on our anniversary. Thoughts on fashion: There really is something to the way Parisians dress. They seem very good at the effortless, comfortable look that is also chic. There were tempting patisserie windows everywhere. One thing I particularly noticed was the variety of treats. Montreal has tasty patisseries, but they all mostly carry similar items. 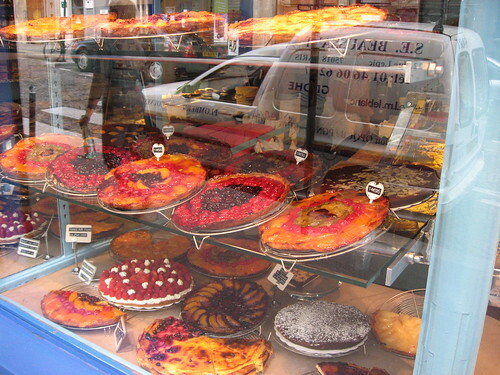 In Paris, each shop clearly had its own specialties. On rue de Rivoli, you will always see a big line-up outside this cafe. It's worth the wait. 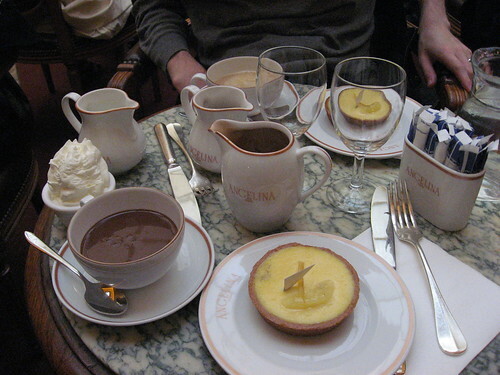 These little tartes citron were amazing (and the hot chocolate that they're famous for is pretty yummy too). 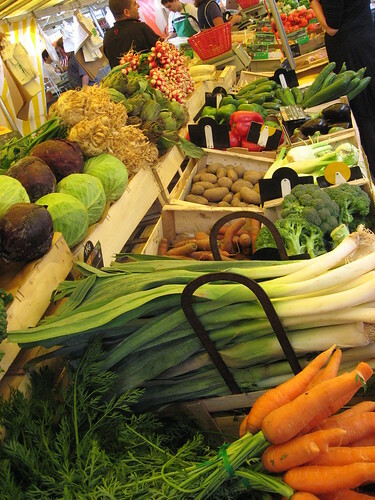 We enjoyed wandering around a farmer's market on our last morning in Paris. We tried some yummy items that we could eat on the go (a huge apple, some scrumptious raspberries, and a delicious hot za'atar bread). Next time, I definitely want to stay somewhere with a kitchen so we could shop at the markets properly. 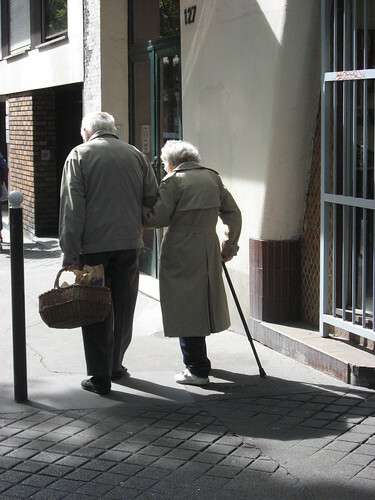 I thought this elderly Parisian couple with their shopping basket presented a sweet image. We even saw a real model in Paris, getting set up for a shoot along the Seine. I felt my most embarrassedly touristy getting pictures of her, but it was such a classic Paris moment, that I'm glad we did. 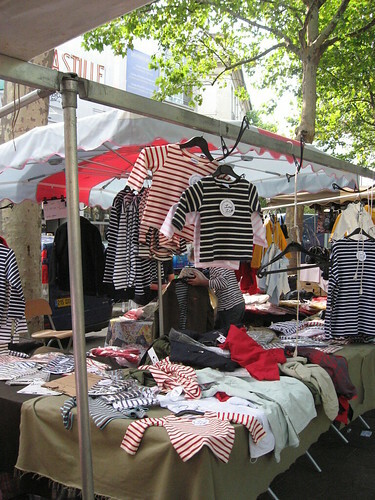 I always thought the striped shirt thing must be exaggerated, but we saw people wearing them everywhere. Clearly it truly is a fashion staple. There's a lot to see in Rome so this series ended up longer than I planned! See Part 1, Part 2, and Part 3. But look what it says here! We thought this statue had a lot of personality. 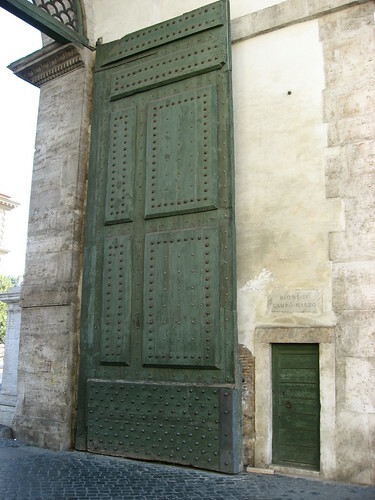 The entrance to the Piazza del Popolo had this great contrast in door size. For reference, the little door on the right is a normal human-sized door. 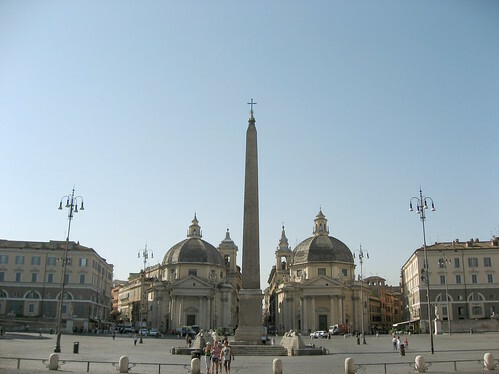 The Piazza del Popolo was symmetrical and expansive, with another Egyptian obelisk in the middle of the fountain. The whole fountain had a bit more of an Egyptian mood. 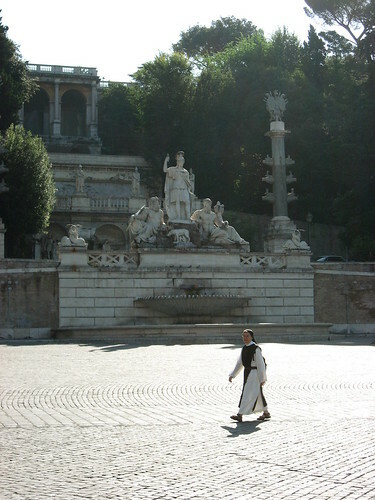 Nuns were a much more common sight in Rome than anywhere else I've ever been. 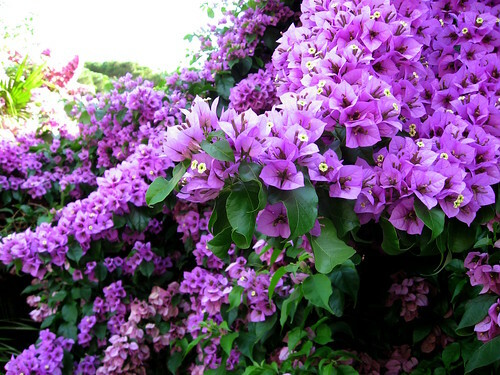 We retreated up to the Villa Borghese park for the afternoon and saw this pretty bougainvillea on the way. This brings to a close my retrospective on our holiday in Italy last August. We had a wonderful visit, saw many ancient, and beautiful things, and ate quite a bit of pizza, pasta, and gelato! 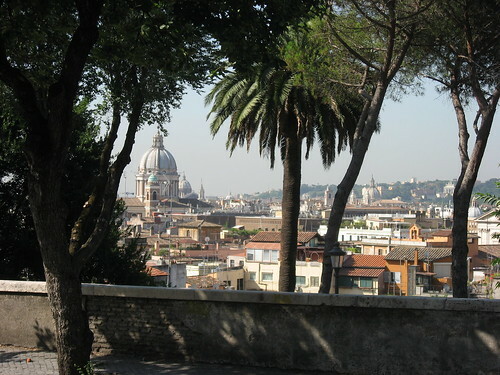 You can see all my pictures from Rome in my trip to Italy set. 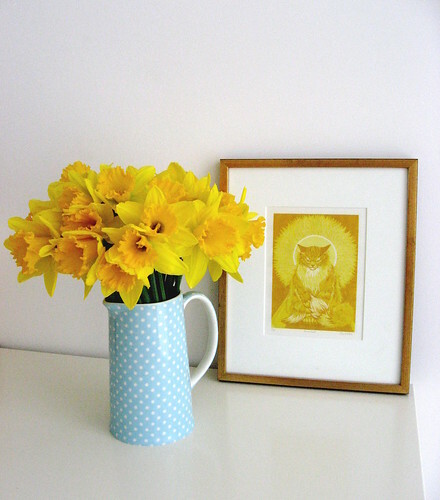 It may be a bit misty outside today, but there's lots of sunshine inside! I love how affordable flowers are in Holland -- this bouquet of 30 daffodils was just 3€! 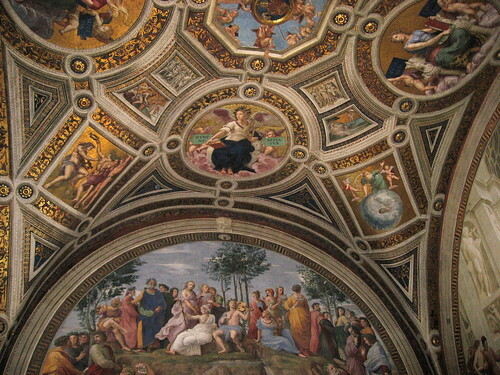 This penultimate post in my review of our trip to Italy is about the Vatican museum. We spent about 5 or 6 hours there one afternoon, avoiding the heat. 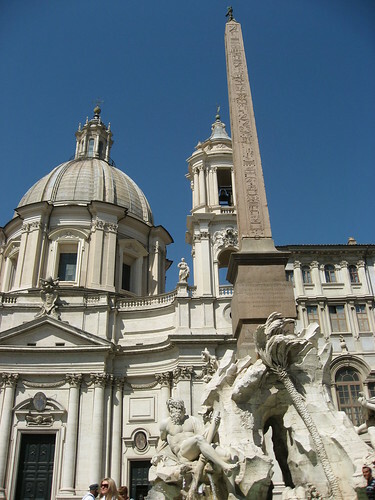 If you only go to one museum in Rome, this is the one to see. The building itself is beautiful. 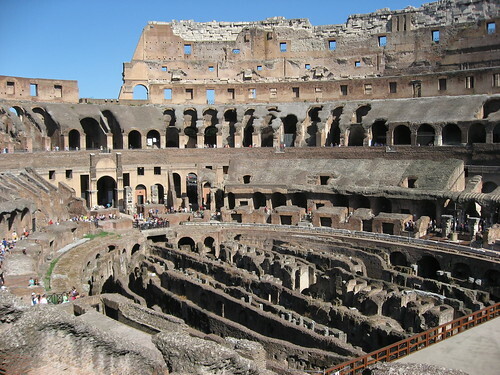 There were Egyptian artifacts and ancient Roman sculptures and Italian masterpieces. Most of the rooms that housed these treasures were lovely in their own right since it's a palace that's been converted into a museum. The ceiling in the map room was particularly impressive. 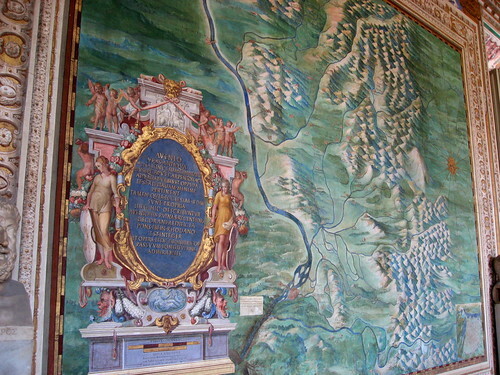 I expected paper maps when I read the list of things in the museum, but it's actually a room full of fabulous maps painted on the walls! 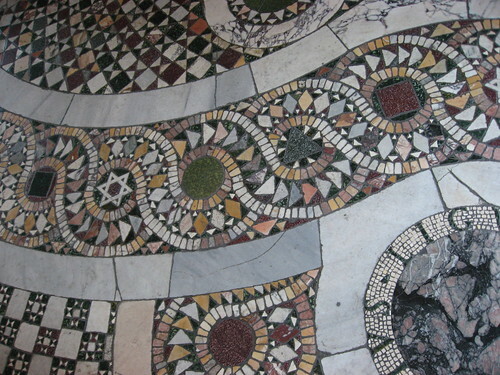 The floors are also pretty fantastic, with several rooms that had beautiful mosaic tiling. 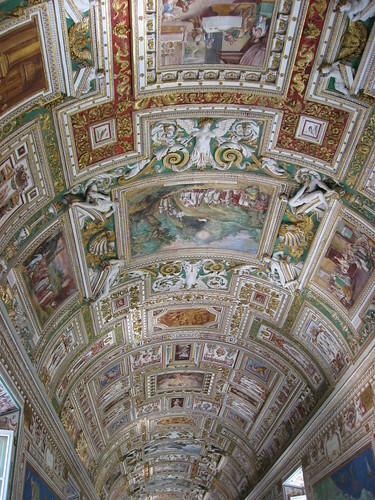 You really could have a great visit, just looking up at the ceilings the whole time. 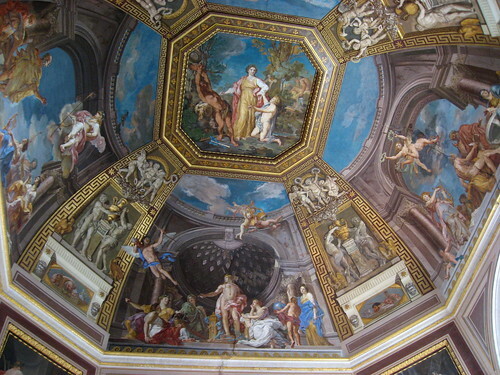 We took the long route through the museum and were rewarded with some of the most amazing ceiling frescoes. 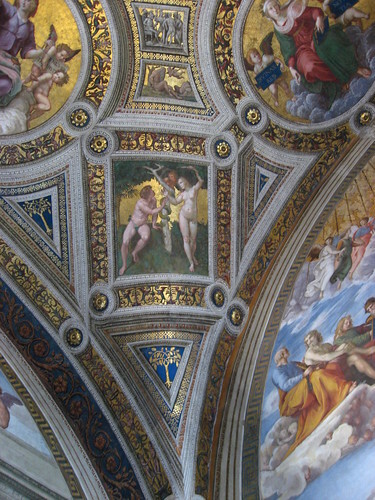 If you take the "get to the Sistine Chapel quickly" shortcut, then you miss out on a lot. 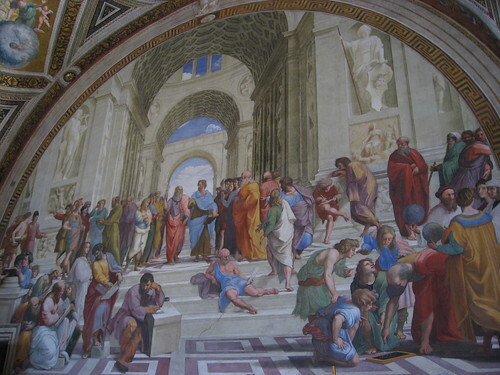 In particular, you'd miss seeing the famous School of Athens fresco by Raphael. 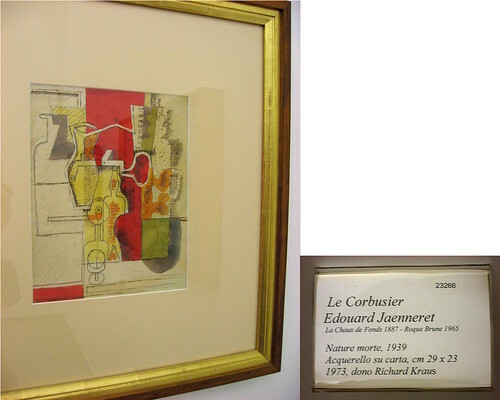 And just so you don't think it's all ancient stuff and frescoes, there's modern art too! On the more practical side, the museum also houses a hall full of historical pope conveyances (somehow you can't really call a golden carriage a "pope-mobile") and a room full of Vatican City stamps. 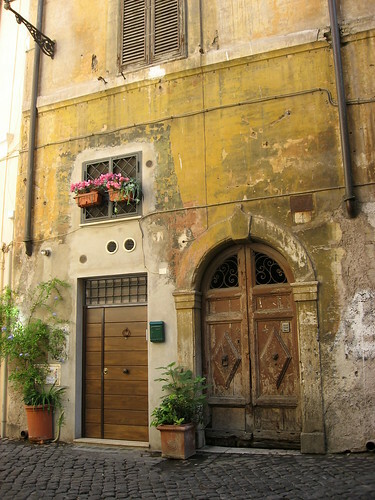 As promised in Rome - Part 1, I have a few of the simpler scenes of Rome to share. We tried to avoid the most touristy cafes in Rome and found our way to those a little farther from the hotspots. One day we had lunch in a little side street with a charming view. I always like spotting some of the ordinary life going on when I'm in a touristy place. 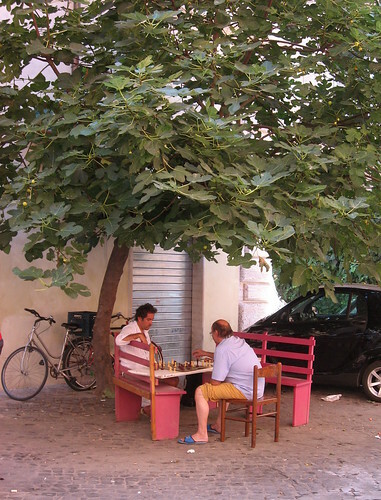 I thought these two gentlemen playing chess under a tree in the afternoon was lovely. 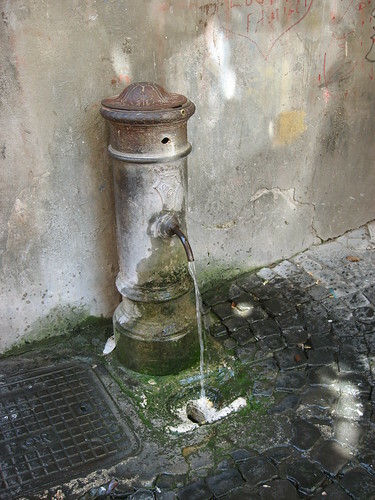 These water fountains were everywhere in Rome and they are fabulous. It was nice not to have to feel that we either had to ration our water nor that we had to buy bottled water. The water was freezing cold and we refilled our water bottle A LOT. 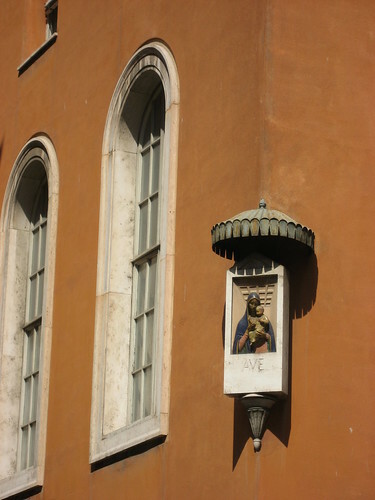 I spotted several of these little corner shrines throughout our visit to Italy. To contrast with the old, there's also the new. 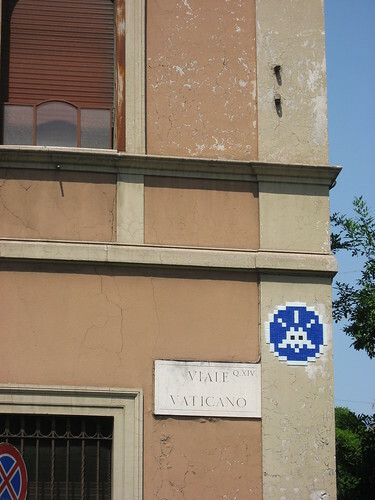 I've been enjoying spotting space invaders throughout our travels in Europe. 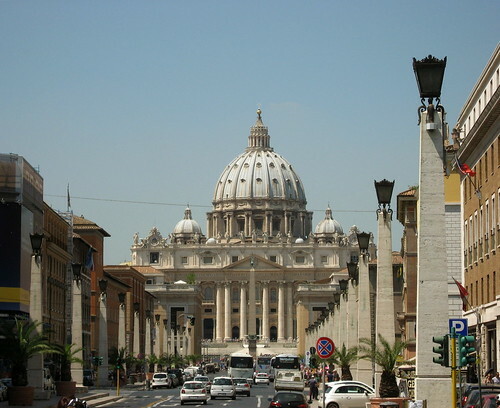 This one was just outside the Vatican City. No visit to Rome (and certainly not one in August) would be complete without gelato! 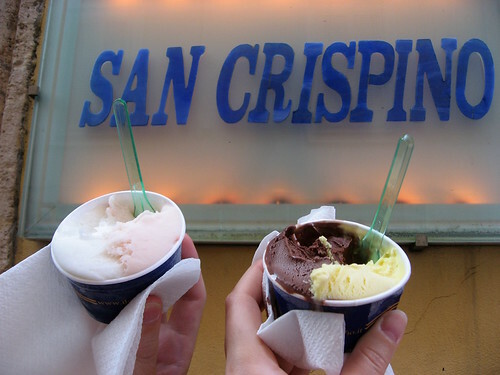 If you try no other gelato in Italy, you shouldn't miss San Crispino. While all the various gelatos we had were delicious (the lime one in Pisa was another highlight), San Crispino's gelato is outstanding. We later went back and had the raspberry flavour too and it truly tasted exactly like eating a fresh raspberry ... it was incredible. Homemade macaroni and cheese definitely qualifies as one of my top comfort foods. This recipe is based on how my Dad taught me to make it. Grate a big hunk of extra-old cheddar cheese (the white stuff preferably and the older/sharper the better) and set aside. While your macaroni is cooking, make a white sauce (aka Béchamel). The basic ratio is 1 Tbsp butter and 1 Tbsp flour to 1 cup of milk (or 2-2-1 for a thicker sauce, but since you'll be adding cheese, stick with the 1-1-1 ratio for this recipe!). How much sauce you make depends on how much macaroni you are making. I usually do a 2 cups of milk batch for a 9x13" dish of macaroni and cheese. Make your roux (melt the butter, mix in the flour, and cook a bit), then slowly whisk in the milk. Bring it up to simmering and then turn down, stirring until it thickens. If you get lumps, whisk it vigorously to remove them. You can avoid lumps by pre-warming the milk and adding it slowly, so it blends evenly. Once the sauce is thickened, slowly add 2/3 of your grated cheese, stirring it in as it melts. 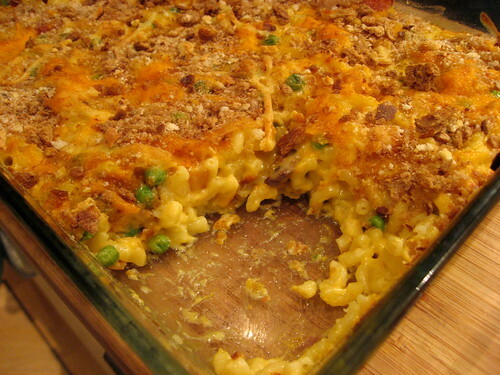 You can also optionally cook some delicious add-ins like green peas, chunks of bacon, chopped shallots, sliced mushrooms, or anything else you fancy in your macaroni. Mix your cooked macaroni and cheesy white sauce and put it all in a baking dish. Stir in any add-ins. 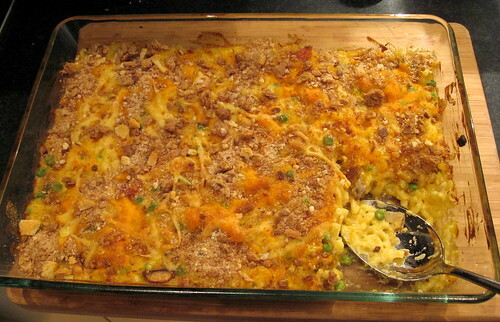 Top with the remaining 1/3 of your cheese, and add lots of bread crumbs to the top as well. Bake at 350°F or 180°C for about 15-20 minutes or until the sauce is bubbling up and the top is nicely browned. You can find more of my recipes in the Food section, in the tabs along the top. 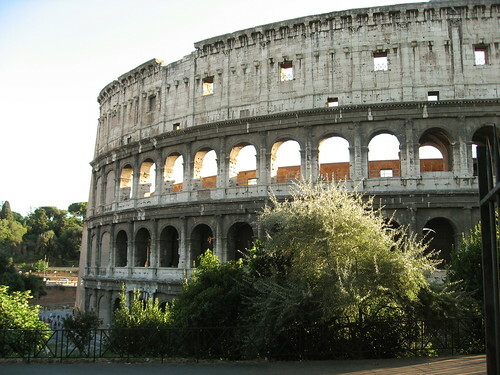 The last city in my series of posts on our trip to Italy last August is Rome. See also: Pisa, Siena, San Gimignano. We only spent a few days in Rome, but we saw a lot. I can't really recommend visiting in August... the one thing none of these pictures convey is just how hot it was from about 10:30am to 7:00pm! 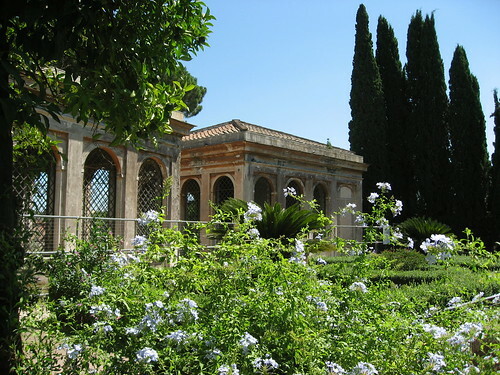 We mostly spent the afternoons in cool gardens or air-conditioned museums! Stepping inside the Colosseum was a bit mind-boggling... particularly to someone from Canada, who's used to things being considered "old" when they've been around for 150 years! 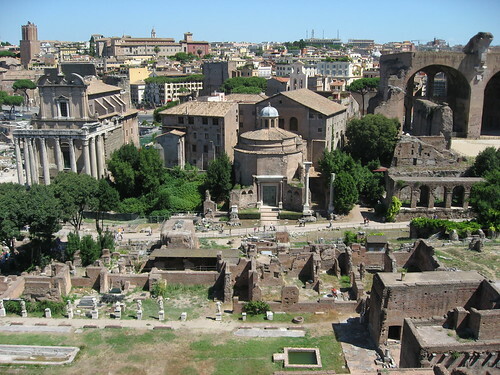 Nearby the Colosseum are more Roman ruins at Palatine Hill, which then joins into the Roman Forum. 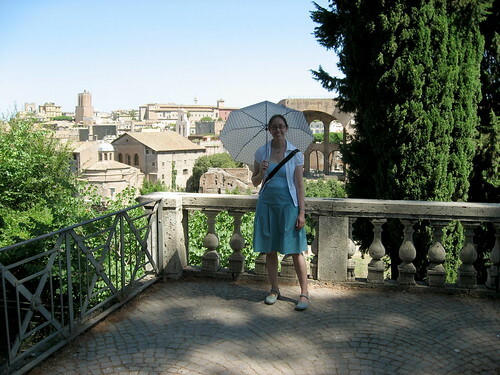 Don't be fooled by the photo: while I may look all cool and breezy, I was roasting even in the shade. 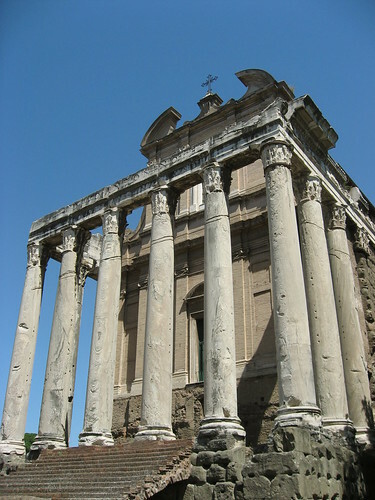 The Roman Forum is enormous and there's not much in the way of interpretive signs to explain what you're looking at. 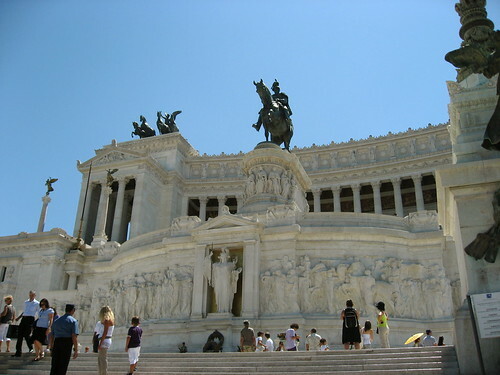 Even in more modern times, the Italians sure know how to build impressive monuments! The Tomb of the Unknown Soldier was blindingly white in the sun and gave us both a headache, so we only looked at it briefly. 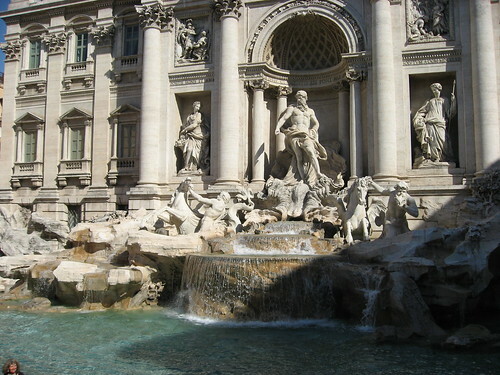 The Trevi Fountain is similarly impressive. The fountain sort of melts out of the back of a building into a tiny square. It's enormous, beautiful, loud with rushing water, and very awe-inspiring. I definitely recommend visiting early in the morning before there are massive crowds. 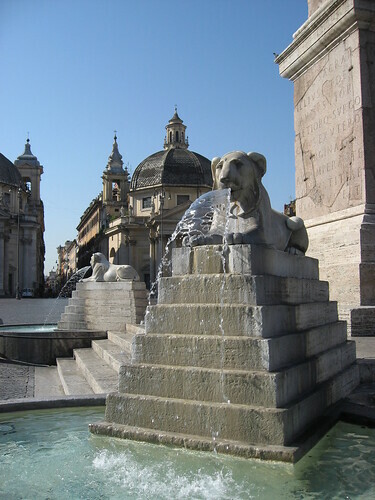 Everywhere you go in Rome there are beautiful fountains and ancient Egyptian obelisks and remarkably beautiful architecture. One does start to get a bit jaded to the grandeur of it all. 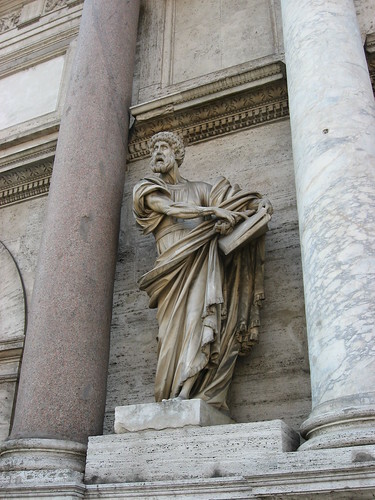 So in my next post, I'll share a few of the less ostentatious sights in Rome.